At the beginning of the final Clasico of 2017, a huge banner was unfurled by Real Madrid supporters at the south end of the Santiago Bernabéu welcoming a 'White Christmas'. At its end, it was the small handful of Barcelona fans high in the opposite stand who celebrated. Way below them, their players applauded: theirs will be happy holidays. Luis Suárez, Lionel Messi and Aleix Vidal scored to give them a victory that carried them nine points clear at the top of the table, 14 ahead of their biggest rivals. In August Gerard Piqué had admitted he felt "inferior" to Madrid; how quickly things change. By the close here, Barcelona's superiority was startling, imposed bit by bit here. Unusually for the Clasico, this was the early kick-off as Spain sought a far-eastern audience and, for a moment, the Bernabéu thought there had been an early goal too. It was still only one minute past one when Cristiano Ronaldo's header went in off the bar but, as it bounced down, he saw the linesman's flag raised. When Toni Kroos pulled the ball back to him near the penalty spot soon after, he missed it, swinging but failing to make proper contact. Barcelona had been warned; 10 minutes in, they had barely had the ball. There was a surprise in Real Madrid's starting XI as Zinedine Zidane left out Isco, and it was not for Gareth Bale but for Mateo Kovacic. The Croatian had played superbly in the Spanish Super Cup in August and here he fulfilled a dual function, a loose element in a midfield where the other three men - Casemiro, Kroos and Luka Modric - occupied their usual roles. Kovacic, meanwhile, focused on Sergio Busquets in an attempt to deny Barcelona a way out from deep and on Messi when they did. As the game progressed, it was more the latter than the former, evolving almost into a man-marking job. If the plan was to starve Barcelona of possession it was working but Madrid did not create much. When the focus became Messi instead, Busquets started to find more of a way out, and that may have contributed to the goal when it came. Nor did it serve to prevent Messi from ultimately controlling this match. If Barcelona did not mind not having a huge amount of possession in the early stages, and were in no hurry to create chances, perhaps it was natural. They had arrived with an 11-point lead over their rivals, after all. 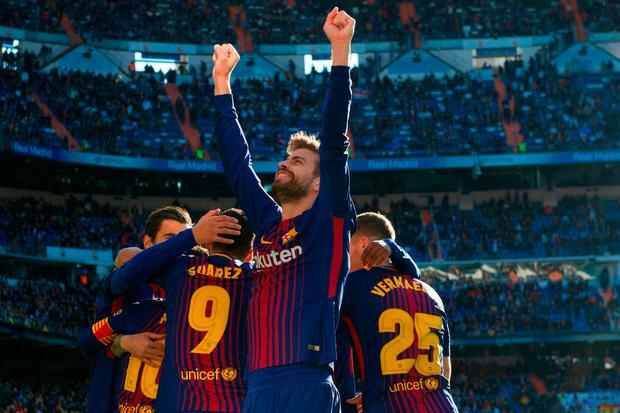 Visiting coach Ernesto Valverde had warned that it is when you are on top that Madrid hit you and the most threatening moments followed that script, Madrid occasionally breaking through into space when Barcelona stepped forward. Thomas Vermaelen brought down Modric as he ran through and then Ronaldo dashed down the left, his shot turned away by Marc-André ter Stegen's foot. Then he dashed down the right and pulled back for Karim Benzema, who was blocked by Piqué, sliding in at the near post. Just before that, Messi had clipped a wonderful ball into the run of Paulinho. Stretching, the Brazilian's volley was pushed over by Keylor Navas. The same three men were involved soon after, when Paulinho's header from Messi's cross was saved at the near post. From the corner, Piqué's header hit Dani Carvajal. 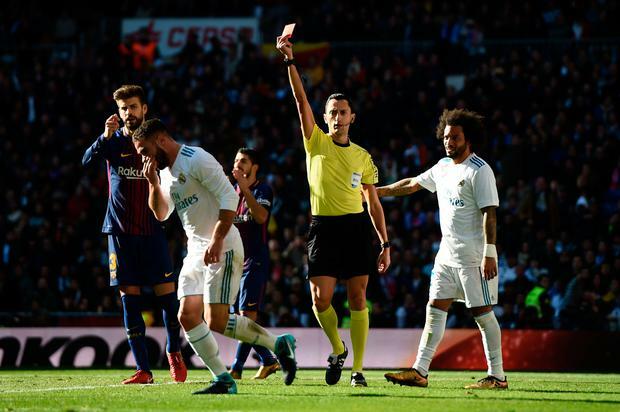 Clear chances were relatively few but at the other end, Marcelo's superb cross was headed against the post by Benzema, and Messi's free-kick in the last minute of the half thudded against the side of Ronaldo's head. As they departed upon the whistle, he held out a hand. Barcelona began the second half reacquainted with the ball, and more consistently. A sudden, sharp pass from Andrés Iniesta released Jordi Alba, who pulled it back for Luis Suárez, but his shot was under-hit. A minute later, Busquets turned not far outside his own area. Stepping away from Kroos, he played the ball beyond Modric for the run of Ivan Rakitic. The pitch opened in front of him as he ran, Kovacic heading out of his path to follow Messi. Rakitic laid it right for Sergi Roberto, who pulled it back across the area for Suárez running in to finish below Navas. Barcelona had the lead and it could have doubled when the Uruguayan hit the side-netting soon after. Madrid were preparing a change when they did. Bale and Marco Asensio stood at the side of the pitch as Messi ran through the middle, dropping the ball off for Suárez to leave him one-on-one with Navas. The goalkeeper saved the first shot but Messi collected the rebound and gave it back to Suárez, whose second shot came back off the post. Paulinho was there to head goalwards, only for Carvajal to decide to turn into a goalkeeper, dive and make a neat one-handed save. Paulinho bundled the ball over the line but the referee pointed to the spot, from where Messi thumped the penalty into the top of the net for his 50th Barcelona goal in 2017. Carvajal walked, head down. Nacho replaced him and, 10 minutes later, Bale and Asensio were introduced too, a last attempt to break Catalan control. 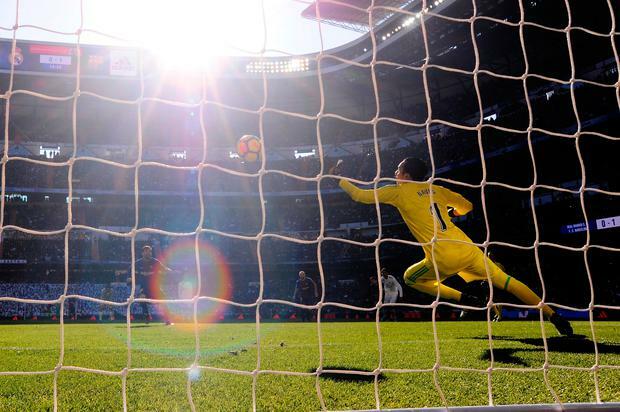 Messi drew another save from Navas, who also stopped Nélson Semedo's shot as Messi played him in one-on-one. Twice more Navas stopped Messi, albeit these interventions were more routine and Madrid had not given up. Ter Stegen made a fantastic save from Bale, fast and low from close range, before momentarily spilling an easier shot from the Welshman soon after, then he blocked a shot smashed towards the near post by Sergio Ramos. There was still time to score. For Barcelona, at least. Messi evaded Marcelo and ran into the area, pulling the ball back for Vidal to finish, the ball squeezing under Navas and over the line. Vidal had been on he pitch less than a minute. It was over. The Clasico, and maybe the league too.